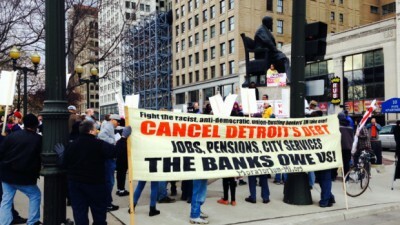 May Day demonstrations in Detroit this year were focused around the ongoing struggle against emergency management, forced bankruptcy and the role of the banks in the economic crisis. A coalition of 35 organizations, including the Moratorium NOW! Coalition, Detroiters Resisting Emergency Management (D-REM), the local chapter of the National Action Network (NAN), the Rosa and Raymond Parks Institute and others, came together for a day of actions in support of labor and the movement to reclaim the political direction of the majority African American city. Held under the theme of “No Business As Usual,” organizers appealed to the public to refrain from going work, buying consumer goods and to take the struggle to the streets to make the presence of the people felt. The day began at 8:00 a.m. with an ecumenical gathering at the hall of UAW Local 600, the largest autoworkers union in the United States. This event was broadcast live over TV 33 based in Highland Park, an African American owned network that also simulcasts on the largest cable network in the region. Speakers at the event included former Detroit City Councilwoman JoAnn Watson, Rev. David Bullock of Greater St. Mathews Baptist Church in Highland Park, David Sole of the Stop the Theft of Our Pensions Committee (STOPC) and many others. After the morning rally, a car caravan mobilized at UAW Local 600 traveled down Vernon Street in the center of the Latino immigrant community as an act of solidarity in support of immigrant rights. The caravan arrived at Hart Plaza downtown at Noon where it was welcomed by cheers of hundreds who had already gathered at the location which is a major thoroughfare in the municipal and financial district of the city. After a rally at Hart Plaza where many retirees and community residents spoke out against the stealing of the vote, the threats against pensioners and the role of the banks in the destruction of the city, a section of the demonstration moved into the street and blocked traffic on Jefferson avenue where hundreds of vehicles were coming off of the Lodge freeway. Although the police attempted to encourage the demonstrators to leave, they were able to hold the area for over twenty minutes creating a logjam throughout downtown. By this time marchers had taken the streets on Woodward Ave., the city’s main thoroughfare, where they began to march into the heart of the financial district. Marchers began to chant “Make the Banks Pay” as they walked two blocks to the Detroit headquarters of Chase Bank. Demonstrators moved onto the steps of the bank while a contingent of the protesters walked right into the building chanting “Make the Banks Pay.” Within seconds the corridors on the first floor were filled with angry demonstrators. The management and security personnel moved rapidly to lock the doors leading into sensitive areas of the building. People held the building for several minutes and then marched back into streets on Fort Ave., where they headed toward the federal courthouse, the location where the largest municipal bankruptcy in U.S. history is being litigated. A brief rally in front of the federal courthouse condemned the entire process of forced bankruptcy and demanded that the state constitutional protections for pensions be upheld in court proceedings. Protesters marched around the entire lobby and first floor area of the five-star hotel denouncing Orr and demanding that he be forced to leave the city. Police arrived several minutes later but did not make any arrests when people decided to leave the building and head towards another area of downtown. Capitalist interests in the city have embarked upon a massive gentrification program in downtown. Senior citizens, workers and people living with disabilities are being forced out of apartments in the area and a new social layer of corporate managers and business people are being moved into buildings where rents have been raised by 400-500 percent. The May Day march quickly moved to the Capital Park district of downtown where gentrification and dislocation are the order of the day. Chanting ‘stop gentrification’, the demonstrators stood outside “The Albert”, a row of buildings where people have been evicted to make room for the higher income managers and businesspeople connected with the ruling class interests of Quicken Loans, Little Ceasars Pizza, and other capitalists who are seeking to displace thousands living in the areas of downtown, Brush Park and the Cass Corridor. The owners of the Redwings Hockey and the Tigers Baseball teams have been given free land and enormous tax breaks to build a new arena downtown that will force the closure of small businesses and pressurize others to leave the neighborhood. A rally was then held at Grand Circus Park which has recently been placed under private management by banking mogul and large-scale real estate owner Dan Gilbert. The final part of the May Day activities concluded with a speak-out at Central United Methodist Church located across the street from Grand Circus Park. Workers, retirees and youth spoke to the need to escalate the struggle against the emergency management and the banks. Speakers were also present from Flint and Highland Park, two majority African American cities that are also under emergency management by the state. Efforts to organize statewide are continuing and a meeting was held in Highland Park on May 3 which enjoyed the participation of the Moratorium NOW! Coalition, Detroiters Resisting Emergency Management (D-REM), the Michigan Welfare Rights Organization, and other groups. Retirees and workers are demanding that the union leaders hold a mass meeting to explain the latest revisions within the plan of adjustment for the bankruptcy hearing coming up in late July. Although media reports indicate that Orr has backed off steep pension cuts, other provisions within the plan indicate that there are many uncertainties and conditions that are disadvantageous for the workers and retirees. Many May Day participants said they will vote no on the plan of adjustment which is a program for the further enrichment of the banks and corporations at the expense of the workers. A call has gone out across the U.S. for people to come to Detroit on July 24, the tentative opening day of the trial on the plan of adjustment, for a mass demonstration against austerity, the attacks on pensions and public assets in the city, the state and across the country.